The TV Ratings Guide bob’s burgers f is for family fresh off the boat king of the hill last man standing one day at a time raising hope roseanne speechless Superstore the middle Roseanne Is Silenced. Working Class Families Are Not. Roseanne Is Silenced. Working Class Families Are Not. By now, many have heard of the sudden and tragic downfall of Roseanne. The show was one of the top shows on television both in its original run a few decades ago, and in its revival that aired this spring. Roseanne Barr's recent racist tweet led to the revival getting canceled, Barr being dropped by her talent agency, and even reruns of the original show pulled from the schedules of various syndicators. Roseanne was an extremely important show in this landscape. At its core, it focused on a working-class family, something that is underrepresented on broadcast television. After the controversial cancelation of Last Man Standing and this being the final season of The Middle, this was the perfect time for ABC to demonstrate to audiences that they still support showing working-class families. There is a high chance that Roseanne may never see airwaves again. This is certainly a blow to those who like to watch working class families on TV; after all, it's never a bad thing to laugh along and realize the situations in these shows could be similar to ones your family is going through as well. While no show will ever be Roseanne, here are some from past and present times that could help fill a void for those looking to watch working class families. They are presented in no particular order. Last Man Standing was a high-profile Tuesday premiere for ABC in 2011, but lost a good deal of its audience over its first season. It moved to Fridays at 8pm for its second, which would end up being the first of five seasons in that time slot. Its ratings stayed more or less steady as the league average kept declining, and its 6th season was actually the strongest-rated of them all. Understandably, some were shocked when ABC canceled Last Man Standing in favor of Once Upon A Time. However, the show was not owned by ABC and while strong for Fridays, the A18-49 ratings were less impressive than the total viewership. Last Man Standing stars Tim Allen as Mike Baxter, a religious and conservative sporting goods store director. He has a favorite daughter; the one who is a political conservative and likes to hunt. While he identifies as a conservative, Baxter is not too outspoken for or against President Trump. At its heart, Last Man Standing is a family comedy that does not belittle either side of the political spectrum. While some media outlets made it sound like ABC was silencing Allen for being a conservative, the show was more likely not making enough money for them. All 6 seasons of Last Man Standing are available with a Hulu subscription. Other options include downloading for $1.99/episode on iTunes, Google Play Store, YouTube, Vudu, or Amazon Video. It is currently syndicated on CMT, Hallmark Channel, and Freeform. The show will return for a 7th season this fall on FOX. Raising Hope was not a ratings hit. In fact, it more than likely wouldn't have made it four seasons had it not been for high-rated lead-ins early on as well as to fulfill syndication prospects. For this all to happen, the show had to have had internal support from FOX. They even gave viewers advanced notice that the fourth season would be its final one. The basic background of Raising Hope's premise is that a young adult unexpectedly gets a woman pregnant who herself is given the death sentence after the birth of the child due to actually being a serial killer. As a result, the father of the child raises the child with the assistance of his traditional family. The family depicted in Raising Hope is tight on money compared to those on many other shows, and having to raise an unexpected child certainly does not help their finances and their dream for more than they already have. The middle-aged parents work respectively as a maid and a struggling landscaper, neither of which are high-paying jobs. This family gets by through the means of each other more so than money. Raising Hope does not tend to focus on politics, and the stars of the show are not outspoken conservatives like Roseanne Barr is. Instead, it focuses on the core values of family amidst financial troubles. All 4 seasons of Raising Hope can be watched with a Hulu subscription. Other options include downloading for $1.99/episode on iTunes, Google Play Store, YouTube, Vudu, or Amazon Video. Bob’s Burgers has been airing since 2011 and flew under the radar for the vast majority of the time. It hasn’t seen the ratings of staples The Simpsons and Family Guy much until this past season, and is often preempted in the fall in favor of a football post-game show. The show mixes the wackiness and randomness one would expect from an animated comedy with the struggle of being a working class family. Bob owns and operates a burger joint across from a popular Italian restaurant, and often does very little business outside of one loyal customer. His three kids, none of which are above the age of 13, work as his waiters. They actively avoid their landlord, as the restaurant isn’t giving them much money to live off of. They know that there’s a possibility they are one health inspection away from being shut down, and it doesn’t help that their inspector used to be engaged to Bob’s wife. While Bob’s Burgers doesn’t talk about money a lot, it’s usually clear in episodes that the family does not have a lot of money. They work with and enjoy what they have, even if they can barely make a living off the restaurant. Bob’s Burgers will air Sundays at 8:30pm this fall on FOX. It is available for digital download as well DVD for the first five seasons. It can also be viewed with a Hulu or Amazon Video subscription. Select episodes are online on TBS and Adult Swim’s websites, as it is syndicated on both networks. Roseanne (the show) made a controversial joke about ABC’s push for diversity in their family sitcoms through the deadpan delivery of the line “they’re just like us”. Fresh Off The Boat is indeed about a working class family, and is the first sitcom to star all Asian-Americans in roughly 25 years. Fresh Off The Boat talks the most about their lack of money in earlier episodes. Like in Bob’s Burgers, the patriarch of the family owns and operates a family restaurant. Louis Huang moved his family out of Chinatown in D.C. to the white-dominated suburbs of Orlando so he could follow his dream of opening the restaurant. At first, the place has a lot of trouble drawing in customers, and has led to Louis having to lie to his wife about how it is doing so she does not get concerned about money. Even when the restaurant starts to do better, the Huangs are not said to be any better off their your average American working class family. The show will return for a 5th season on ABC Fridays at 8pm this fall. In the mean time, previous episodes can be viewed with a Hulu or Amazon Video subscription or via digital download or Vudu. Select seasons are available on DVD, and some recent episodes are on ABC’s streaming app. Speechless is a comedy about an average American family with one major catch: their oldest son cannot talk or walk due to cerebral palsy. He communicates via a computer system and the translator assigned to him by the school he attends. Right from the beginning of the trailer for this show, it’s clear that the family in Speechless is tight on money; a scene involves the mom speeding to a restaurant in time to use a coupon to eat breakfast. Additionally, the school the child attends is not cheap; the family forces themselves to live in the cheapest house they can find in the general area. The father has a job working at an airport; they make ends meet, but aren’t the most well-off family either. Speechless is certainly not ABC’s first show about a working class family in this family comedy era, but it is well-received. Speechless will return this fall on ABC in the Fridays at 8:30pm time slot, airing right after Fresh Off The Boat. Some episodes can be found on ABC’s website/app, and all can be found with a Hulu or Amazon Video subscription. Other options to watch include Vudu or digital download. touched upon, and the reboot takes more of a dramatic spin. With a multi-camera setup and focus on a working class family, One Day At A Time can prove to be a solid watch for someone who wants more Roseanne; especially if Roseanne Connor wasn’t their favorite character. This lesser-known Netflix animated show takes place in the 1970s and centers around a family in a typical town trying to make ends meet. The patriarch of the family is a war veteran who works at an airport and hates it. He often complains about how he doesn’t make a lot of money, and is extremely protective of what he does make; he doesn’t like purchases being made behind his back. He has zero tolerance for his family at times because of it. The matriarch of the family starts out as a housewife, but later gets into the workforce after a company liked her idea for a new product. However, she has to put up with inappropriate advances and sexism within the company. None of the three kids are particularly smart or talented. This is a different type of show in that it doesn’t always try to be hilarious, and there’s no moment at the end of an episode where the family makes up and gets along with one another after the conflict from earlier in the episode is solved. Sometimes, that conflict is not solved at all. If you are looking for a show that captures the mood of some working class families in the 1970s, but doesn’t always show a ton of heart or an artificially positive spin on things, you may be interested in this show. The animated nature allows the characters to be played by voice actors of different ages (and sometimes genders), but in general operates more like a traditional single-camera show. F Is For Family is a Netflix exclusive, where it has aired 16 episodes and was recently renewed for a 3rd season. While this show attracted audiences on both sides of the political spectrum and is said by some to unite the sides, the Hill family is largely a country-loving, God-praising conservative family from Texas. The patriarch is a salesman, and the matriarch is a barely-getting-by substitute teacher. The show focuses on the realism aspects, and trades in the wackiness that can often be found in an animated comedy with depictions of more realistic events. 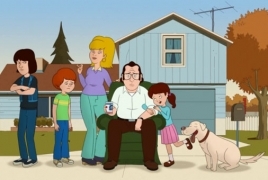 Like F Is For Family, it plays out more like a single-camera comedy that is animated for the sake of casting flexibility. This is one of the few shows on this list where the family is not only working class, but also largely conservative. In this sense, the family operates like Roseanne. While they are definitely different shows, King Of The Hill takes a unique look into a conservative, working-class family in modern day America. King Of The Hill can be viewed via digital download. A cheaper option would be watching it in syndication; it leads off Adult Swim’s nightly block at 8pm, and rotating episodes can also be viewed on their website/app. A notable honorable mention to this article would be The Middle, which recently ended its run on ABC. The creators of the show got their start as writers on Roseanne, and the show features a working-class family and very often brings up their money issues. They seemingly long gave up on ever being rich and learn to be content with what they have. No politics are brought up in the show, though matriarch-player Patricia Heaton identifies as a conservative off the screen like Barr. The show is currently syndicated on the Hallmark Channel and Freeform, and airs in reruns for now Tuesdays 8-9pm on ABC. It can also be viewed via digital download. The reason it did not make the main list is its lack of a major streaming deal, meaning it’s difficult to just start from the beginning. Another honorable mention is Superstore, which currently leads off NBC’s Thursday night lineup. The show does not center on a family, but it does center around characters who are working class. The majority of the characters are workers at a large chain retail store who are struggling to make ends meet. Main character Amy, for example, recently went though a divorce and is living off of her weekly paychecks to provide support for her child. The sitcom is yet another example of working class people being represented on television. This is not to name every single show that features a working-class family. The main point here is that while many found comfort in Roseanne Connor’s voice, one that is not often depicted on television, there are still other options. I hope at least somebody found a suitable recommendation out of this.